Walk the walk in our Victorian Ankle Boot made in black faux leather, soon you’ll be talking the talk and sipping tea with afternoon callers for goodness sake! Pair with your long bustled skirt or a pair of trousers, if you dare. Fashioned from black faux leather, our classic boots feature a modest 2 ½ -inch heel for comfort and ankle-height rise. Lace up the boots criss-cross through the metallic grommets for the classic look. Imported. Available in Ladies sizes 6 – 12 Also offered in several colors. 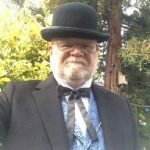 I needed Victorian style boots for a music video shoot and was told about this site by my fellow actresses. They recommend I order a size up and wear thick socks for all day filming, so that's what I did. I simply cannot express my appreciation for the amazing fit and comfort! This is the first time I have come away from an all day shoot without soreness... and we were DANCING in this one! So, I am also an "extras casting director" and do many westerns. I am highly recommending Historical Emporium to all of my extras as well as main cast members. Who knew that you didn't have to pay $150-$200 to get the look??? These boots were a steal at UNDER $50! So pleasantly surprised! Thank you!!! I purchased a size 7 and the fit is amazing! I could wear them every day! I am a "B" width. My feet are neither narrow or wide, and they are not bulky, but slender. My instep is small, and my heels are slim. These were a perfect fit and I was not bothered in any way by the pointy toe. These boots went perfect with my dress, and they were so comfortable! WE are using these for our production of Mary Poppins for all of the lead ladies. I was concerned about sizing and comfort. The ladies are now rehearsing in their shoes and we have had no problems.They do have to have high socks on with these as the girls are not used to having anything around their ankles. One of my girls does have a bigger ankle and cannot lace it up all of the way. We may have to use black elastic. I have wide feet and these boots provide plenty of space for me. They are perfect for all of my costumes. I ordered these to go with my Edwardian suit, to wear Christmas eve. The shoes fit beautifully, and all I can say is I LOVE THEM! These boots are the real deal. I bought these for a costume, but I will wear them out and with thick socks. I could walk in them and I'm usually in flats. Can't wait to wear them with long skirts this winter. I have wide feet and they fit me. Yay! They are fairly well made for the price but just need them for a costume. Have not worn out yet. We shall see! Exactly as expected. On time delivery. Good product. Easy ordering. Victorian Ankle Boot 1 black 1 brown. My 80year old mother wanted these boots i ordered them for her birthday. They arrived very fast even the brown boots that was special ordered you guys are great! Best Vegan Granny boot I’ve found. You’ll definitely want to wear this with a sock or some type of hosiery. I also find that I have to unlace the top two sets of eyelets to put this shoe on or take it off (not a quick slip on boot) Overall Excellent value! 10/10 would buy again. These are great to wear, and I walked everywhere with them on. They are light, soft and comfortable to wear. I highly recommend buying a pair because they are so wonderful yet plain enough to wear with any outfit. They do run a bit narrow. Order the next size up. I love mine. The lady that these were purchased for absolutely loved them. They fit perfectly, were very comfortable and looked amazing. She said they were just exactly what she was looking for and these will complete her "Saloon Girl" outfit completely. Come on Halloween, we hope to win the competition! Great products; quick delivery; i wish there were more discounts and sales. I own 6 shirts and a beautiful vest. You guys rock. Ordering was easy. Delivery was faster than estimated. The tooled gun belt was nicely done but the .22 cartridge loops were a little tight for LR ammo and very tight for WMR ammo. Hoping they will loosen over time with some use. holster fit my 5.5 inch Ruger nicely.